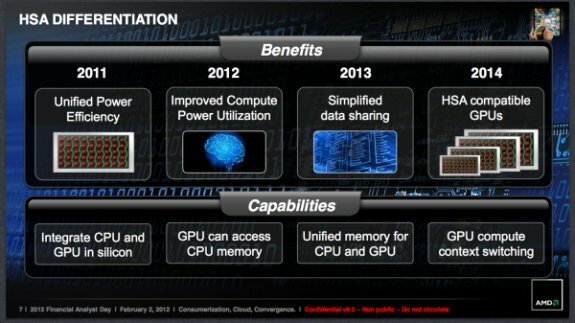 AMD announced its first real Fusion chip will arrive in 2014. This year the focus is on enabling the GPU to access CPU memory, next year the company will reveal unified memory for CPU and GPU and in 2014 we can expect the first heterogeneous systems architecture (HSA). This year we got Graphics Core Next, but next year we'll see a unified address space that both AMD CPUs and GPUs can access (today CPUs and GPUs mostly store separate copies of data in separate memory spaces). In 2014 AMD plans to deliver HSA compatible GPUs that allow for true heterogeneous computing where workloads will run, seamlessly, on both CPUs and GPUs in parallel. The latter is something we've been waiting on for years now but AMD seems committed to delivering it in a major way in just two years. The direction looks very promising. but since everything is so changes dramatically, need to wait a bit for completion, and grinding. Well, still have to wait until the period of skimming completed. Intel with its developments could greatly reduce the waiting time.